The annual event hosted by the Student Alumni Association (SAA) is back! 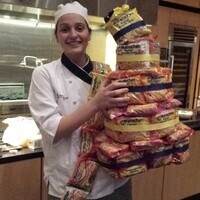 Watch your fellow classmates compete in a most unique three round event (appetizer, entree and dessert) cook-off ending with one finalist being crowned the 2019 SAA Ramen Noodle Cook-Off Champion! Free for anyone to attend and free Ramen Noodles and other great prizes to be given away.